(Original Platform) How do I connect a social profile? To use Atomic Reach's Share module for social sharing as well as to discover and track when your social network is the most active, you need to connect your social account with the Atomic Reach platform. Connect a social account to an existing Atomic Reach account. You can use the Quick Method to connect a social network account if you do not currently have any other accounts from that social network connected. To connect multiple social accounts from the same network, please follow the Standard Method. Step 2. Click on the Social tab and click on the Connect button for the social network you wish to connect to. Step 3. Follow the instruction in the pop-up window. If you do not see a pop-up window, make sure your pop-up blocker is temporarily disabled on the current web page. Step 4. Click the green Refresh button and if your account connected properly you should now see it listed under the respective network. Step 5. Make sure the timezone for you account is correct, this will affect the calendar view in Share. Step 1. Go to Content Sources. Step 2. Click the Connect button for the social network you wish to connect to. 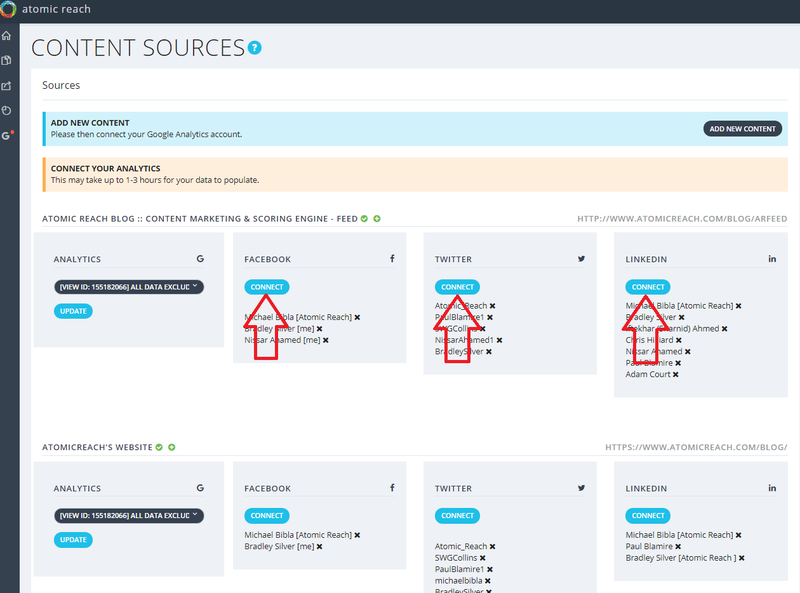 You will notice that you have the option to connect the social account to either a specific content source (if you have one connected) or as the default to your Atomic Reach account. Step 3. Follow the instruction in the pop-up window. If you do not see a pop-up window, make sure your pop-up blocker is temporarily disabled on the current web page. Make sure you select the correct company page if your are trying to connect a company page instead of a personal one. Step 5. You can connect multiple social accounts to the same network using this method, just repeat steps 1 to 4 for each account you wish to connect. Step 6. Make sure the timezone for you account is correct, this will affect the calendar view in Share. If you are experiencing issues with connecting your social account, please reach out to support@atomicreach.com and we'd be happy to help you resolve this issue.